.22 Long is a great cartridge and while it has become something of a curio and relic, it still has nostalgia and usability in guns that are still as fun as the day you learned to shoot with them. This is a plain vanilla .22Long cartridge featuring a 29 grain copper plated projectile and brass rimfire case. .22Long can be used in a .22 LR firearm, but generally it doesn’t function all guns properly nor is that what its sweet spot is. Used in tube magazine guns that have a chamber specifically for this caliber is where it makes the most sense. Getting an extra 1-2 shots from your favorite childhood gun while teaching Junior how to shoot squirrels is where the .22 Long finds its sweet spot. Plinking tin cans or shooting at far away objects out back is where the .22 Long finds its home. A very straightforward cartridge which is kind of rare nowadays: this is simple, plain, and just the same as you remember. A 29 grain projectile moves at 1215 fps at the bore exit. Max effective range for small game is around 75 yards depending on conditions and the game. This ammunition is suitable for very small game like rabbits, gophers, squirrels and close range for things like coyotes. Q: Is this safe to shoot in the ruger 10 22? A: While the pressures of a 22 Long round are safe for any .22LR 10/22 rifle, the .22LR round will be a more suitable choice for your rifle as the overall length is longer. This will provide reliable feeding into the chamber and reduce jams and malfunctions. 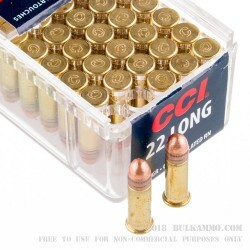 Q: Would this 22 long ammunition be safe to use in a bolt action 22 LR / 22 LR revolver? A: Yes, although it is generally inadvisable to mix ammo types, the .22 Long Rifle is basically a .22 Long case with a longer, heavier bullet. Therefore, it is safe to fire .22 Long ammo in a .22LR firearm. However, if you are buying ammo for your .22LR firearm and do not own a (probably very old) firearm in .22 Long, there is no reason to purchase .22 long ammo. A: These 22 Long rounds are faster than the Aguila Super Colibri - these are supersonic from a rifle. At this time we don't have plans to stock Aguila. 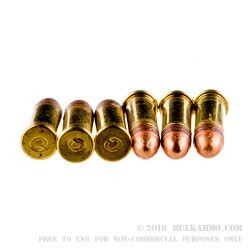 However, you might want to check out the subsonic Armscor ammo we have. A: This depends on the rifle you have. Check to see if it is chambered in .22 Short, .22 Long, .22 Long Rifle, or .22 Magnum/.22 WMR. Then select the ammo that your rifle is chambered for. Q: I had heard in the past that .22 CB's were sub-sonic. However, the second picture shows the velocity on the box, which certainly is not sub-sonic. Am I missing something? Do you carry sub-sonic .22 ammo? A: .22 CB and .22 Long/.22 CB Long ammo are two separate and distinct types. 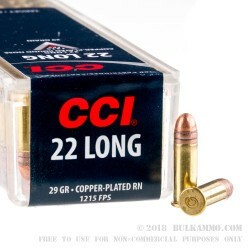 This CCI .22 Long ammo propels a lighter-than-22LR bullet at velocities that are slightly lower than high velocity 22LR ammo. The standard velocity Armscor 22LR ammo we sell is subsonic.